The Alabama Insert reminds me of one of my favorite quotes from Jim Hightower – a populist political writer from Texas – who opined that “the middle of the road is for yellow lines and dead armadillos”. In 1996, the Alabama State Board of Education – an entity made up of eight elected officials and the governor – mandated that a special statement on evolution be pasted in all state-approved biology textbooks. This statement, attempting to appear moderate by using plenty of “fair and balanced” verbiage, casts doubt on the concept of biological evolution and Darwin’s “theory” of natural selection. Coincident with the insert’s publication, Oxford scientist Richard Dawkins had been invited to speak about evolution at Auburn University. Rather than deliver his prepared remarks, he chose to critique the school board’s statement, addressing many of the current misconceptions surrounding the topic. Recently published as an excerpt from Charles Darwin: A Celebration of His Life and Legacy, the brief document is a marvel of concision. The book starts with the full text of the one-page insert, which warns the reader that the textbook to which it’s attached discusses evolution. Using seemingly level headed scientific terminology and avoiding any reference to gods, bibles or religions, the insert attempts to raise doubts about the “controversial theory” of evolution. Dawkins speech follows, which tackles the Board’s statement one sentence at a time. He focuses on the misleading use of words like “theory”, “controversial”, “fact” and “random” and discusses numerous aspects of evolutionary theory as he meticulously dismantles the Insert’s claims and answers each of the questions it asks. He covers micro and macroevolution, artificial versus natural selection, the evolution of the fish eye and vertebrate flight and points out that the evidence for evolution would still be overwhelming even if no one had ever found a single fossil. 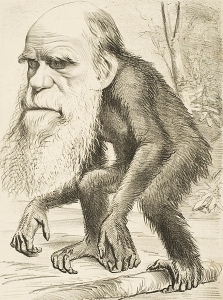 A Darwin caricature circa 1870. While some may disagree, Dawkins keeps his tone respectful and honestly tries to educate his audience by helping them see the weaknesses in the Board’s statement. He only uses the word “stupid” twice – appropriately both times, in my opinion – and is pleased to find a few points of agreement along the way. I’ve read a lot of writing on the topic of evolution over the years – by Dawkins and others – but even in this brief space I encountered some details I hadn’t heard of before. There’s really nothing wrong with skepticism of any scientific idea and Dawkins is not opposed to the comparison of creationism, intelligent design and evolutionary theory in the classroom as long as there is an intellectually honest appraisal of the facts. But sometimes one side of the argument is actually the correct one. 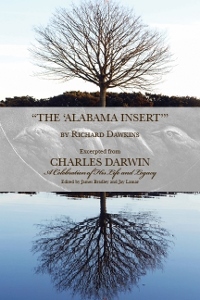 In just a few dozen pages, The Alabama Insert shows that the evidence for evolution is overwhelming and reveals why the author is confident that no matter what the Alabama State Board of Education thinks and no matter how reasonable they may appear to be, thoughtful students will conclude that evolution by natural selection is the most rational explanation of our fascinating biological world. Recommended for anyone who is interested in the never-ending “debate” about evolution. The Readers Lane review of Dawkins’ memoir, An Appetite for Wonder is here.